What is Bhutadamara Mudra? In Bhutadamara Mudra, hands crossed at the wrist, right hand over left, palms facing outward. Typically, two middle fingers are slightly bent. In this position, the wrists crossed in front of his chest. This confluence of gestures portrays the indivisibility of wisdom and method. The Bhutadamara Mudra is a gesture to inspires awe, warding of evil, and a gesture of protection, also known as “Trailokyavijaya”. It is said that fingerprints can intimidate and subdue all evil trickster. Often seen in representations of Vajrapani, one of the earliest Bodhisattvas of Mahayana Buddhism and the protector and guide of the Buddha. So where is the best FengShui placement for a Buddha with the Bhutadnaara Hand gesture? 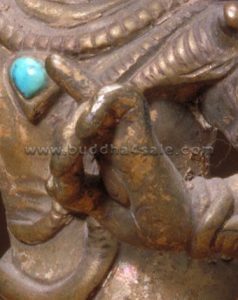 It is highly recommended to consecrate a Bhutadnaara Mudra Buddha in any Bagua area that needs strong clearing, or in a problematic area of the house (such as windows facing a low energy alley, for example), etc.